Dalai Lama sanctioned monks will create a sand mandala with millions of colored grains of sand, along with artistic workshops and cultural events from January 31 to February 5, 2017. Eight Tibetan monks from the Drepung Gomang Monastery in India will bring to St. Petersburg teachings of ancient ways and beliefs that create the possibility of global peace, non-violent conflict resolution, compassion and wisdom. 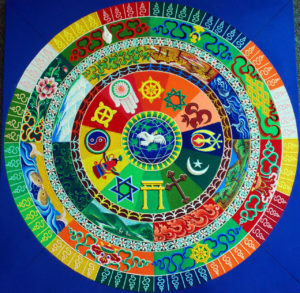 Highlighting their visit from January 31 to February 5 is the creation in Florida CraftArt’s exhibition gallery of a Sacred World Peace Sand Mandala that was designed by the Dalai Lama and depicts all religions in harmony. 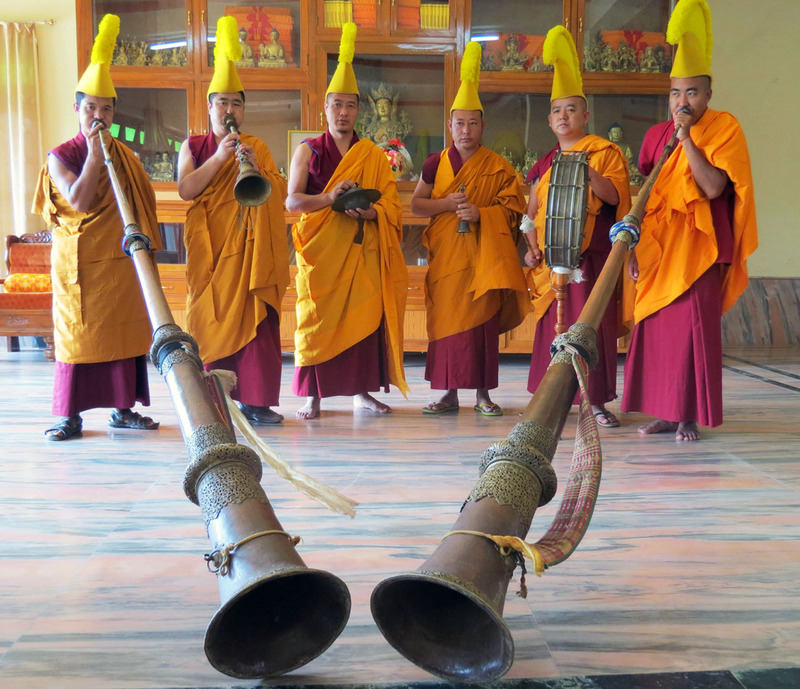 This visit is part of the monk’s nationwide 2017 Sacred Arts Tour, formed to share and preserve the spiritually artistic expression of the Tibetan culture. The monks demonstrate and express their peaceful ways through living art, ritual, dance and chanting. During the opening ceremony at 10 a.m. on Tuesday, January 31, the monks will chant, play long Tibetan horns and consecrate the site of the mandala. Immediately following, they will draw the lines for the design of the mandala on a base. Throughout its creation, the monks pour millions of grains of sand from a funnel-shaped metal tool known as the chakpur. This funnel is filled with colored sand and is then rasped to release a fine stream of sand. The artists begin at the center of the 4-foot wide mandala and work outward. Sand paintings are an ancient art form of Tibetan Buddhism. 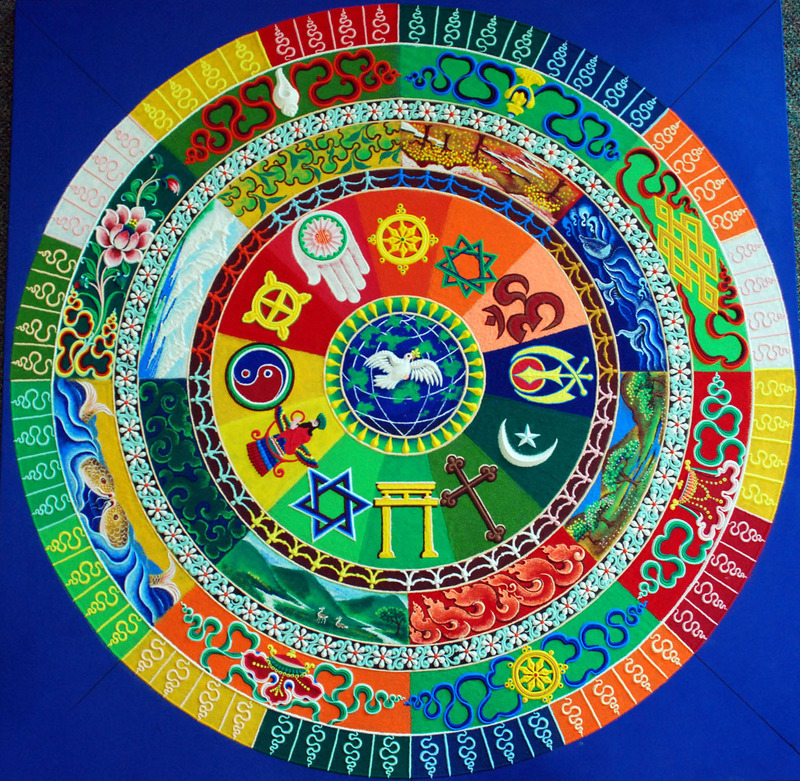 “Mandala” is a Sanskrit word meaning “cosmogram,” or “world in harmony.” Drawn in three-dimensional forms of sand, this art is called dul-tson-kyil-khor, signifying “mandala of colored powders” in Tibetan. In general, mandalas have outer, inner and secret meaning. On the outer level, they represent the world in its divine form; on the inner level, they represent a map by which the ordinary human mind is transformed into the enlightened mind; and on the secret level, they predict the primordially perfect balance of the subtle energies of the body and the clear light dimension of the mind. The creation of a sand painting is said to affect purification and healing on these three levels. On Wednesday, February 1 at 1:30, there will be a conversation about art and spirituality led by Unitarian Universalist Minister Jack Donovan and Maureen McDole, Poet and founder of Keep St. Pete Lit. The monks will chant daily at 10 a.m. and 4 p.m. On Friday, February 3 at 3:45 p.m. the public is invited to join the monks for meditation and chanting. People should bring pillows or mats on which to sit. The monks will teach a workshop on how to paint Tibetan symbols on rocks at 10:30 a.m. on Saturday for a donation of $10. Call (727) 821-7391 to make a reservation. Later that evening, the Unitarian Church will hold a pot luck dinner for the monks at 6 p.m. The public is invited to bring a dish to share. Visit www.UUStPete.org for reservations and information. 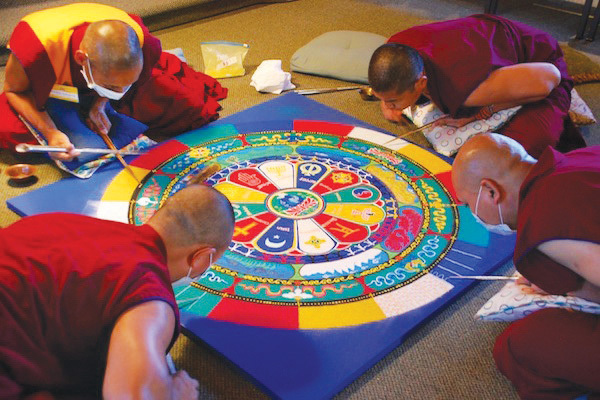 During the closing ceremony on Sunday, February 5 at 1 p.m., the monks will dismantle the mandala, sweeping up the colored sand to symbolize the impermanence of all phenomena. It is meant to be a teaching to show that everything that exists has a beginning, a middle and an end. Then monks will then lead a procession to Tampa Bay where they will deposit the sand and perform a Buddhist blessing. The Drepung Gomang Monastery houses 2,000 monks, providing food, health care, and education for monks living in exile from their home country of Tibet. Between 1959 and 1961 most of Tibet’s 6000+ monasteries were destroyed when the Cultural Revolution Red Guards began to inflict a campaign of organized terror and vandalism throughout all of China and Tibet, to prevent religious freedom and cultural expression. The Dalai Lama escaped, accepted land from India, and established the Tibetan government in exile. Since 1959, Tibetans have reestablished their monasteries in India, housing tens of thousands of monks, and creating schools, hospitals libraries and archives so they can continue their traditions and culture. Tibetan crafts created at the monastery are available for purchase during the cultural tour, with all funds raised helping to provide support for the monastery. As the monks have taken vows of poverty, Florida CraftArt is responsible for housing and feeding them during their visit. The Unitarian Universalist Church of St. Petersburg is a sponsor, and the apartment complex 430 Beacon has generously donated living quarters. The following restaurants are hosting the monks: Hawkers, Hooks, Iberian Rooster and Deuces BBQ. Studio@620 is hosting the monks for a private dinner. Chairs are provided by Coast to Coast Event rental. Committee members are Sarah Butz, Rev. Jack Donovan, Lin Jorgensen, Shay Routh, Kelly Ruoff and Rhonda Sanborn. Florida CraftArt is located at 501 Central Avenue in St. Petersburg. For more information on the monks, visit www.FloridaCraftArt.org or call (727) 821-7391. More images of work available on request. Photo and video opportunities available. download a press release here. Five monks from the Drepung Gomang Monastery place individual grains of sand through metal tools to create the World Peace Sand Mandala at Florida CraftArt in St. Petersburg. Tibetan monks from the Drepung Gomang Monastery perform a ceremony with the long Tibetan horns.